Aries Zodiac Sign Birthstones, Jewelry and Beading Tutorials. Aries are free and independent thinkers who run a mile in a opposite direction if they sense that somebody is trying to infringe upon their freedoms. They are highly observant-nothing gets past them! 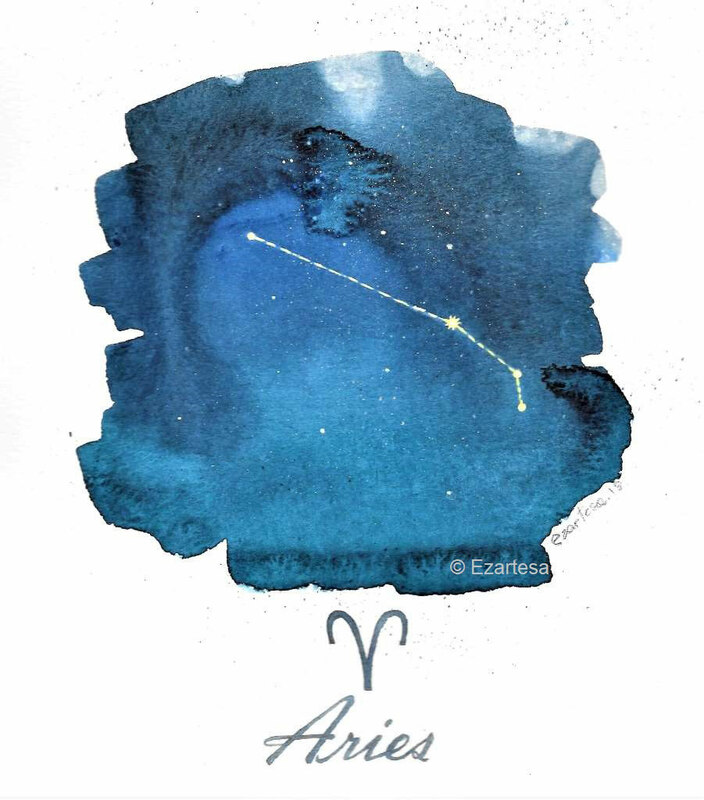 Aries are playful, and fun is always on their mind. Even the most normal and boring day will turn thrilling with them. Aries does not talk about their problems, they fight them. Aries believe that anything is possible. They never put up emotional barriers and don’t have that "can’t be done" mentality. Aries best traits: intelligent, witty, loyal, committed, hard-workers, energetic and adventurous. This is the list of some crystals that are recommended for everyone who was born under this star sign. Diamond, Citrine, Bloodstone, Carnelian, Fire Agate, Amethyst, Blue Kyanite, Emerald, Aventurine, Aquamarine, Red Jasper. Color Choices: Shades of red, orange and blue. These beaded earrings are created from tiny glass seed beads in orange and deep purple colors. The red orange stone is a Cubic Zirconia in color of Carnelian. Power Color: White and orange. Diamond is the “king” of all precious gems, symbol of purity and invincibility. Provides harmony and beauty in any confusing and uncertain situation bringing clarity and protecting from anything you don’t need. Diamonds have been known to attract inspiration, genius and abundance. 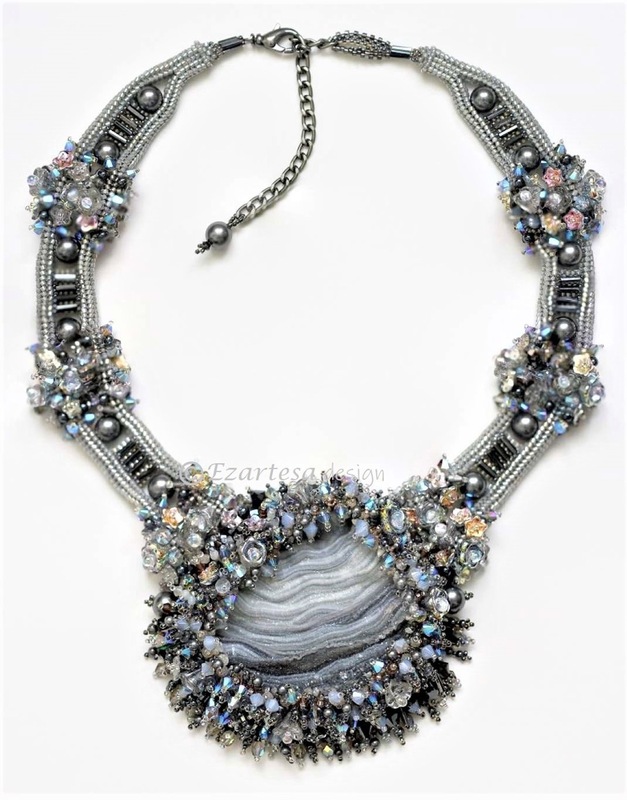 “Universe” hand beaded grey Druzy, Diamond, Moonstone, Swarovski crystal, pearl and tiny glass seed bead necklace. Diamond connects to universal power, clears aura and fills it with light. Powerful enough to drive away evil and bring good fortune. Red Jasper is known as the “supreme nurturer”. It protects against psychical danger, provides insight into difficult situations, brings problems to light before they become super big. 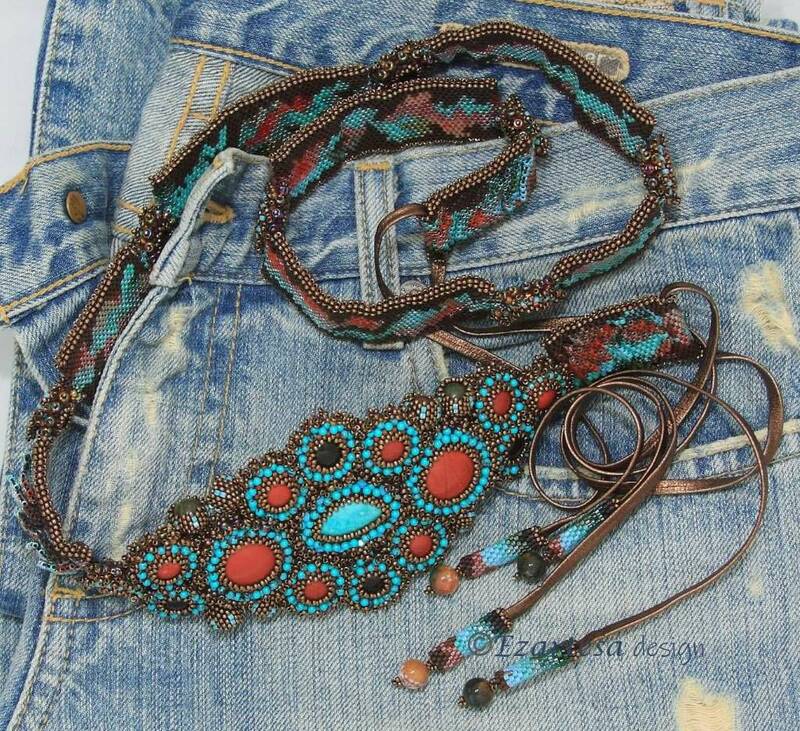 “Flower Power” hand beaded Red Jasper and Turquoise seed bead belt. 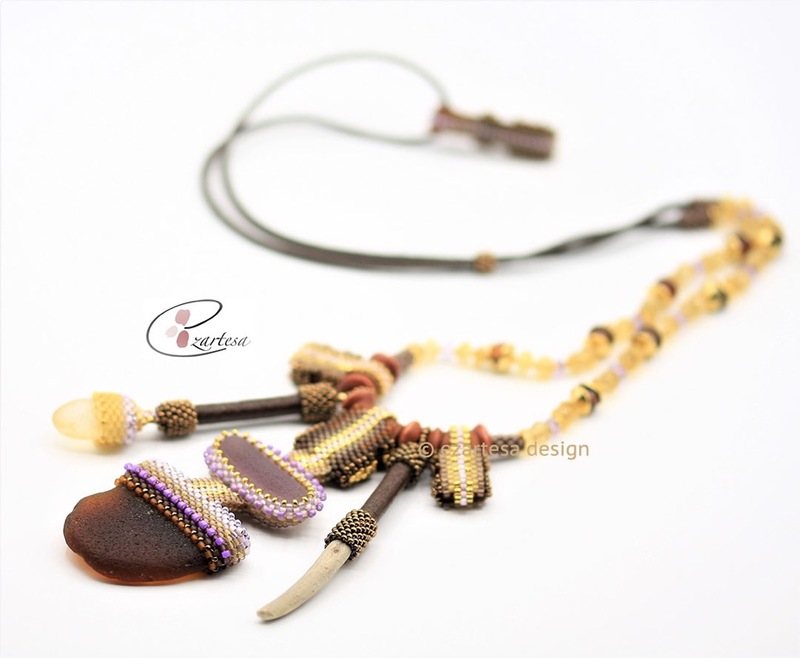 This necklace is created from tiny glass seed beads in colors of orange, yellow, cream, brown and black. Necklace pendant is made from Picture Jasper and Crazy Lace Agate stones. Citrine is the gemstone of light, happiness and abundance. It is the most powerful gemstone for manifestation, helping you to achieve your goals. Creates clear thinking, increases creativity and imagination. It also encourages generosity and the sharing of good fortune. Citrine protects the aura and cleans the chakras. Blue Kyanite stimulates intuition and spirituality. It encourages you to speak the truth, cutting through fears and blockages. Kyanite provides truth and insight for difficult situations while it’s calming properties ready the mind for meditation. 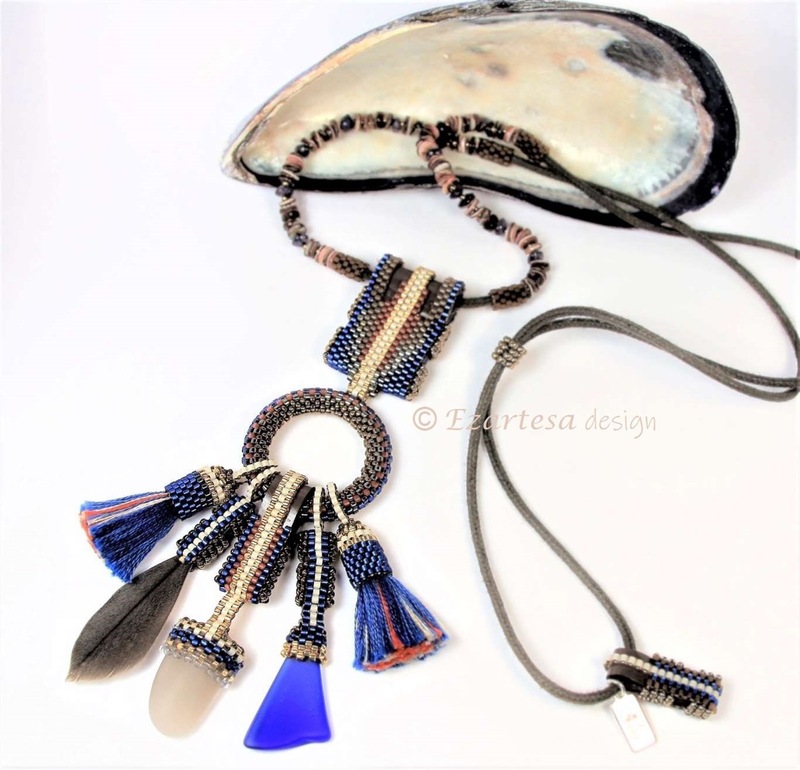 This hand beaded necklace is created from tiny glass seed beads, natural feathers, beach stone, leather, sea shell heishi and Blue Kyanite beads. 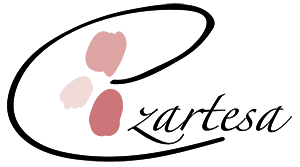 Check my other blogs about zodiac signs, birthstones. How to make sea glass jewelry with glass seed beads. Sea glass is a glass pieces from the broken bottles and jars that had been worn smooth by the tumbling action of the sea waves against the shore. Ocean weaves drags the pieces of glass across the sand and stones, smoothing it and shaping in different shapes, creating frosted and worn surfaces. Sea glass is so pretty that it deserves to be adorned. Use your most precious founded sea glass pieces to make a unique necklaces, earrings and bracelets. Wire wrapping. You would need 20gauge sterling silver, copper or gold-plated wire. Drilling. You would need Dremel drill and drilling press. Bezeling requires more training than drilling or wrapping sea glass. My favorite way of making sea glass jewelry is bead weaving technique. I like to incorporate in sea glass necklaces sea shells and drift wood pieces. 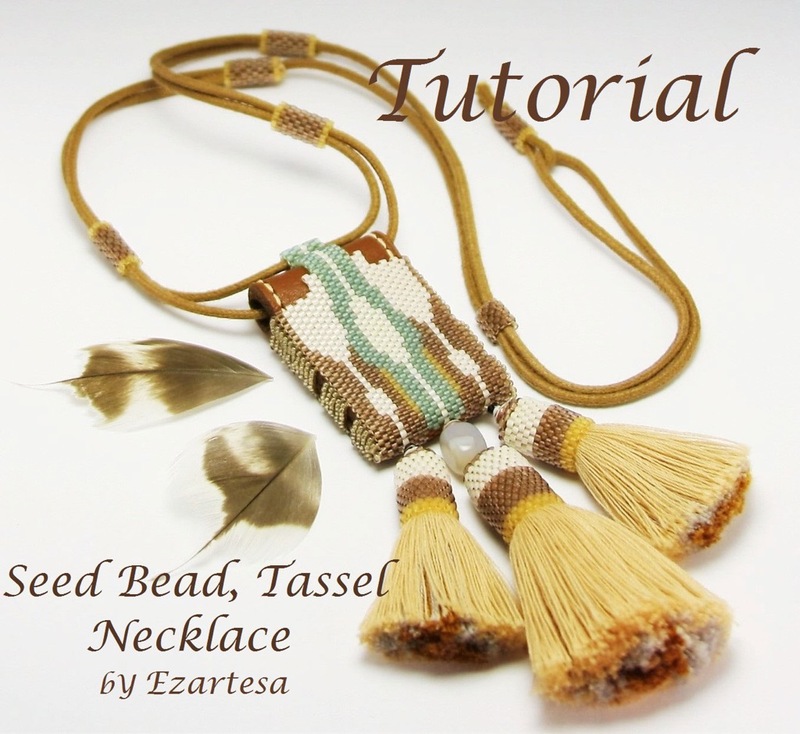 Tu create this mixed necklace you will have to learn basic peyote stitch, circular and tubular peyote stitches. Wood has a grounding quality and it’s lightweight. Some shells already have holes for stringing. I use leather for pendant bails and for clasps. Nylon beading thread (conditioned with beeswax). Usually I start by playing with different shapes of drift wood, beach stones, sea glass pieces till I create the desirable composition. Then I glue the chosen pieces to beading foundation: Put a dab of E-6000 glue on beading foundation, and then glue the material to the back (or around) of the piece of sea glass (beach stone, shell or driftwood). Set the sea glass (beach stone, shell or driftwood) aside and left the glue dry and cure for at least 4 hours (best would be 24 hours). Tie an overhand knot at the end of 2yd. (1.8m) of conditioned thread. Using a # 12 sharps needle, sew through the beading foundation fabric from back to front, next to the stone edge. 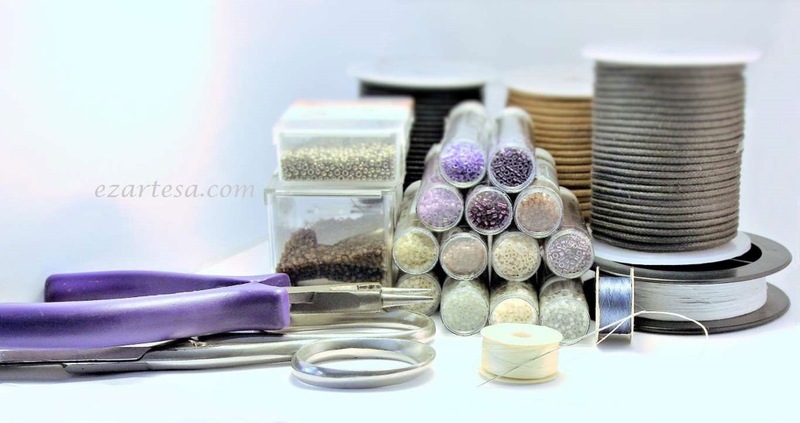 Pick up six Delica Japanese seed beads and position them along the stone’s edge. Sew through the last three beads (figure 1). Continue working in beaded backstitch around the edge of the cab, adding an even number of beads (photo c). 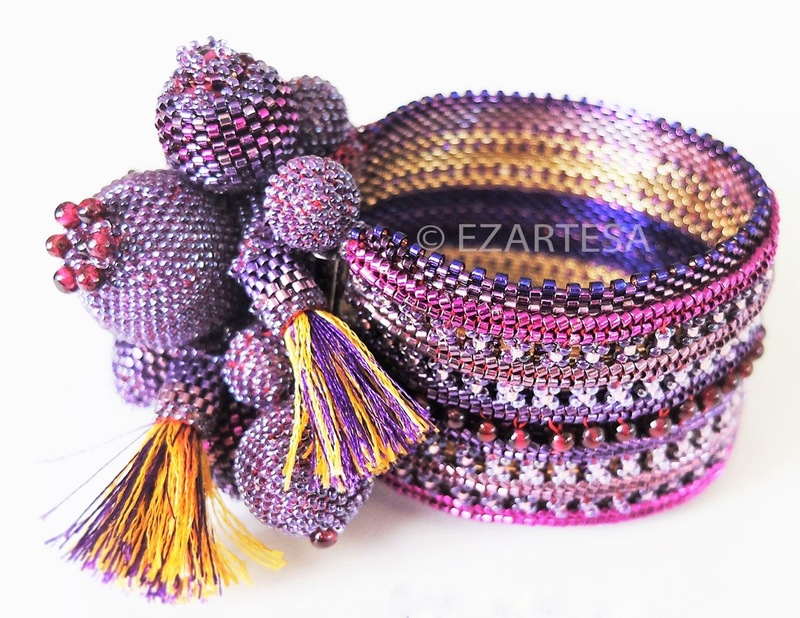 Using a regular beading needle and Delica seed beads, work in tubular, even-count peyote stitch around the ring. Changing seed bead colors for each round, continue adding rounds of peyote until the top edge of the cab is covered (photo d, e). Then I create a bail for pendant: usually I cut desirable piece of natural leather. Then I create gorgeous print/pattern from tiny glass seed beads. For necklace strap I use cotton cord and make an adjustable, sliding clasp. I love combining natural materials in to one big and complicated piece of jewelry. 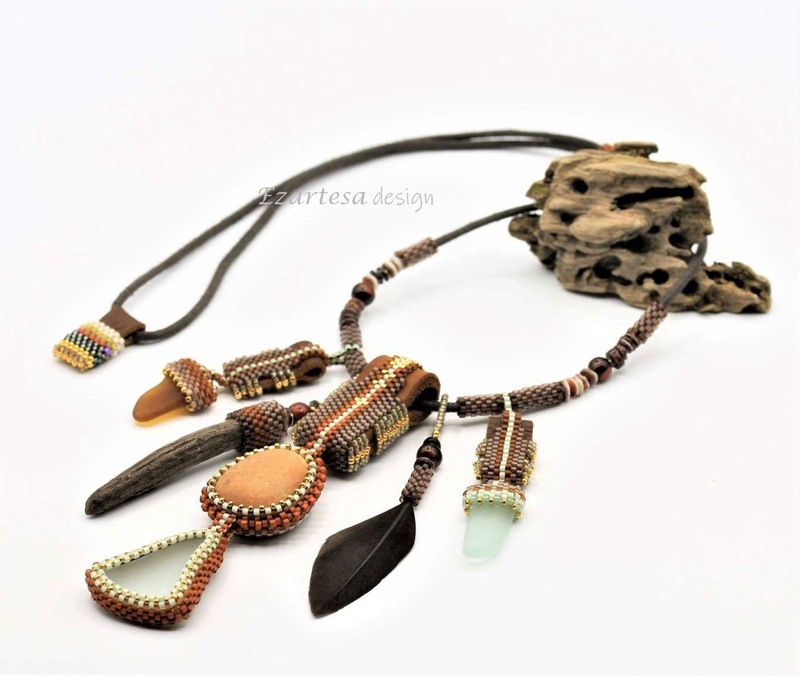 Beach stone, sea glass, feather and driftwood beaded Beachcomber necklace by Ezartesa. 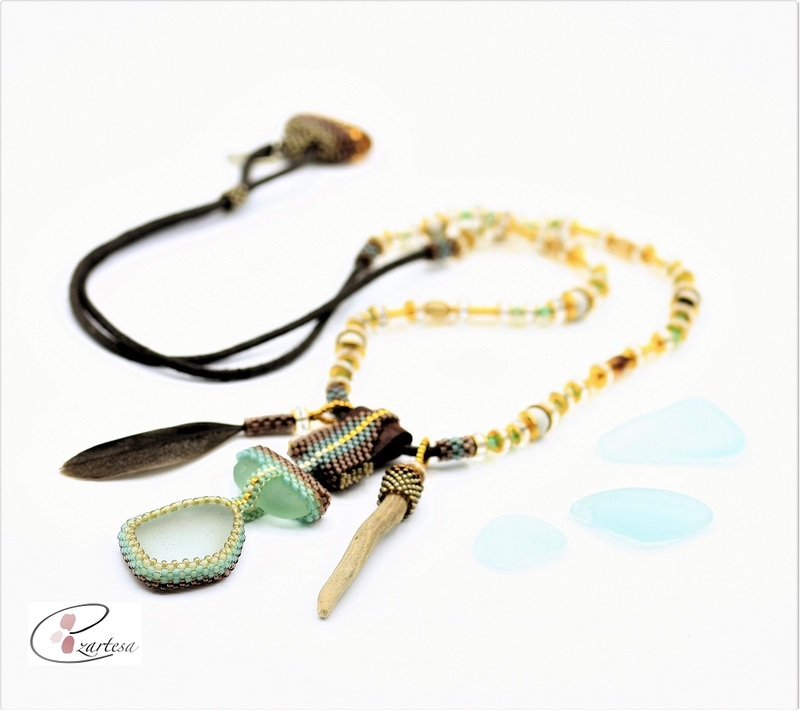 To buy this stunning sea glass necklace press here. Sea glass for sure is the most gorgeous beach find you’ll ever see. If you are lucky, you have stunning ocean tumbled sea glass piece that you can turn into unique jewelry with the wonderful story. 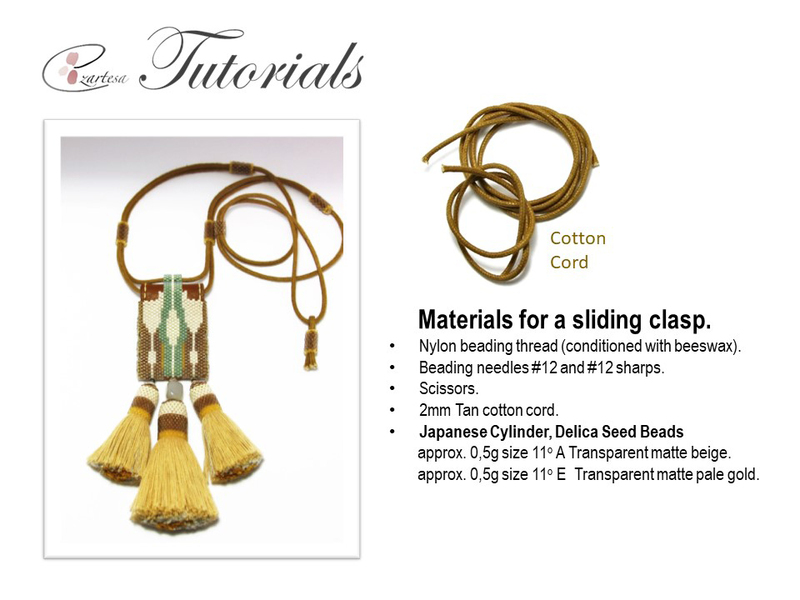 I am showing to you how to make adjustable sliding clasp for beaded necklace with cotton cord strap. 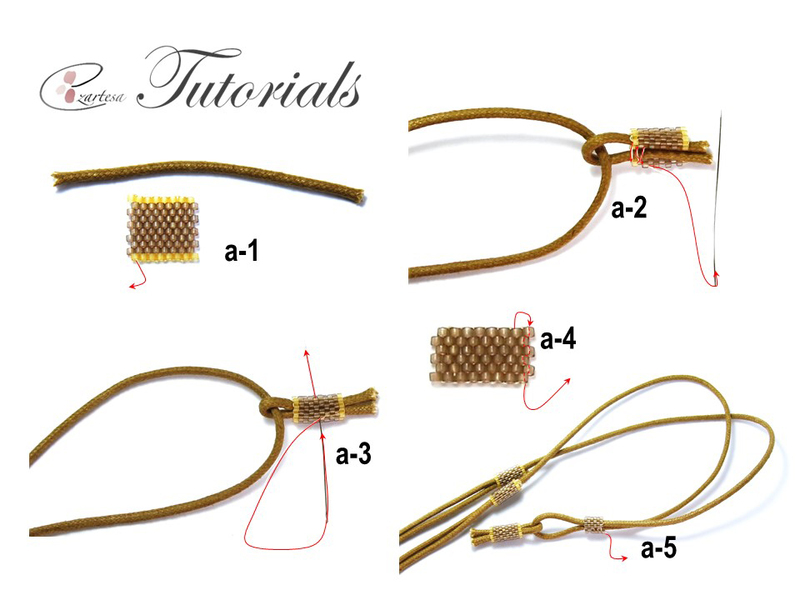 For this tutorial you will need to know simple even-count peyote stitch technique. Step 1: On 28” of thread, and leaving 6” tail work in flat, even-count peyote stitch to make one strip of 10 beads wide ant 16 rows tall (one 11oE, eight 11oA, one 11o E) (photo a-1). Secure the 6” tail thread in beadwork with a few half-hitch knots between beads, and trim. Step 2: Cut a 2” long peace of cotton cord (photo a-1). Wrap it around the necklace strap. Then pick up a finished strip and wrap it around 2” folded cord (photo a-2). Zip up the first and last rows together, retrace the thread path a few times, and with the sharp needle sew through the middle of beaded strip and two cotton cords (photo a-3), weave through the couple beads and repeat one more time. Secure the working thread in the beadwork and trim. Step 3: On 14” of thread and leaving 5” tail work in flat, even-count peyote stitch with 11oAs to make a strip of 6 beads wide ant 16 rows tall (photo a-4). Secure the 5” tail thread in beadwork with a few half-hitch knots between beads, and trim. Step 4: Wrap finished strip around the necklace strap (photo a-5), zip up the first and last rows together (photo a-5). Retrace the thread path a few times, secure the tail in beadwork with a few half-hitch knots between beads, and trim. This last strip should slide, be careful not to sew through the cotton cord. 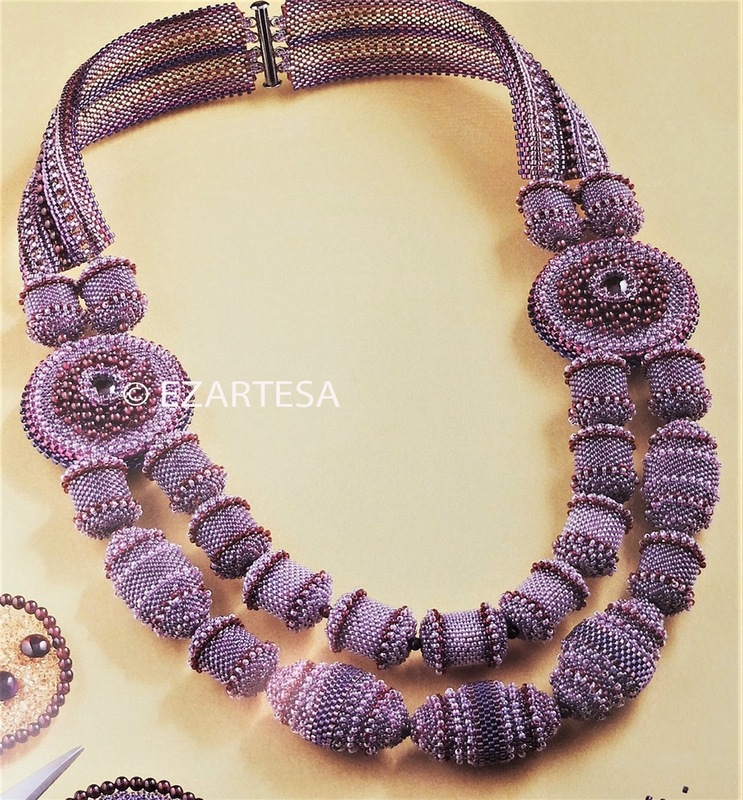 If you would like to learn how to make this bohemian, ethnic inspired beaded seed bead necklace press here. Pisces Zodiac Sign Birthstones, Jewelry and Beading Tutorials. Pisces truly has the most generous and compassionate soul. Tends to be emotionally involved in anything they do. They are honest, unselfish and have a quiet disposition. 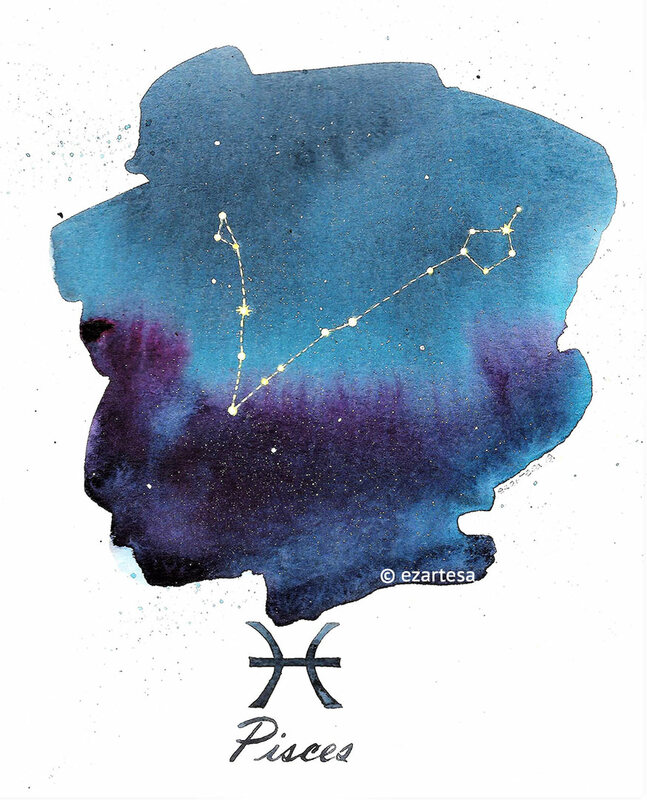 The Pisces is a master at creating things. They can take something and make it into a masterpiece. Aquamarine, Amethyst, Lapis lazuli, Moonstone, Blue lace agate, Bloodstone, Ocean Jasper, Jade, Labradorite, Rose quartz. Aquamarine is a symbol of honesty, loyalty, and beauty. Promotes good health as it’s thought to help cure heart, stomach and liver disease. It’s calming, soothing and cleansing stone. I designed gorgeous beaded half hoop earrings beading tutorial with Pisces birthstone aquamarine beads and tiny silver glass seed beads. Create your own beaded half hoop earrings inspired by Pisces zodiac sign colors and birthstones. Beading pattern is available there. Amethyst - protection, purification and spirituality. Moonstone - stimulates creativity, helps you through personal changes and brings you in harmony. This necklace is hand beaded from tiny glass seed beads in dark and light gray, silver, smoke and Ceylon white color. I used gorgeous big piece of grey Druzy as a base and embellished it with natural Labradorite and Moonstone beads. Buy now this beaded necklace from my etsy shop. Blue lace agate is a gentle, calming crystal. It brings feelings of tranquility, to alleviate anger and tension. It helps to stimulate communication, and expression of one’s self. Pisces colors of choice are soft sea palette with lots of greens and blues, turquoise blue and deep lapis lazuli blue. Power color: purple. 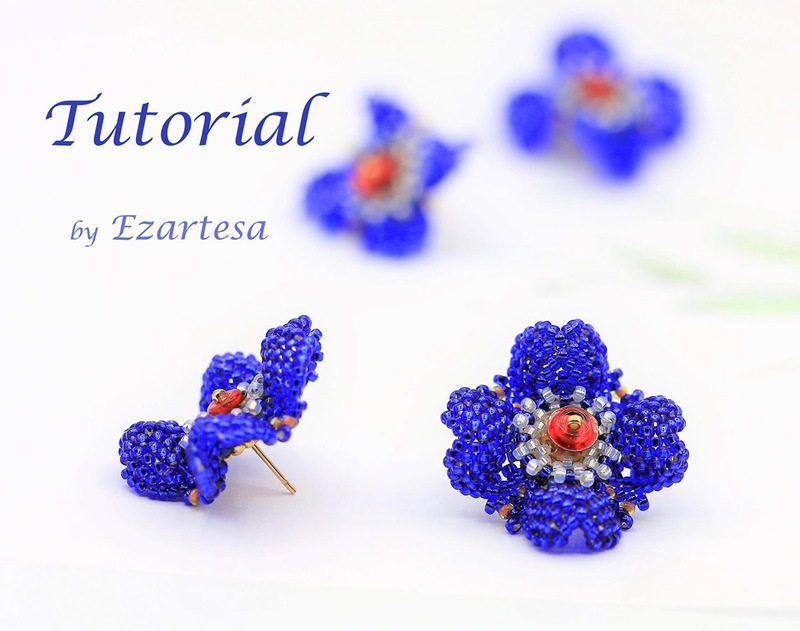 I created gorgeous, deep blue color beaded flower stud earrings pattern. This fun beading tutorial is created for intermediate bead weavers. Make these adorable flower earrings for yourself or as a gift for somebody born under Pisces star sign. You can change little bit these earrings…put in the middle of beaded flower gorgeous green or blue color bead instead of red. Tu buy instant download beaded seed bead flower stud earrings tutorial press there. Aquarius Zodiac Sign Birthstones, Jewelry and Beading Tutorials. Aquarians are the thinkers. They’re always anticipating, always coming up with a new idea, always reconnecting. They like to stir things up from time to time and to be two steps ahead. 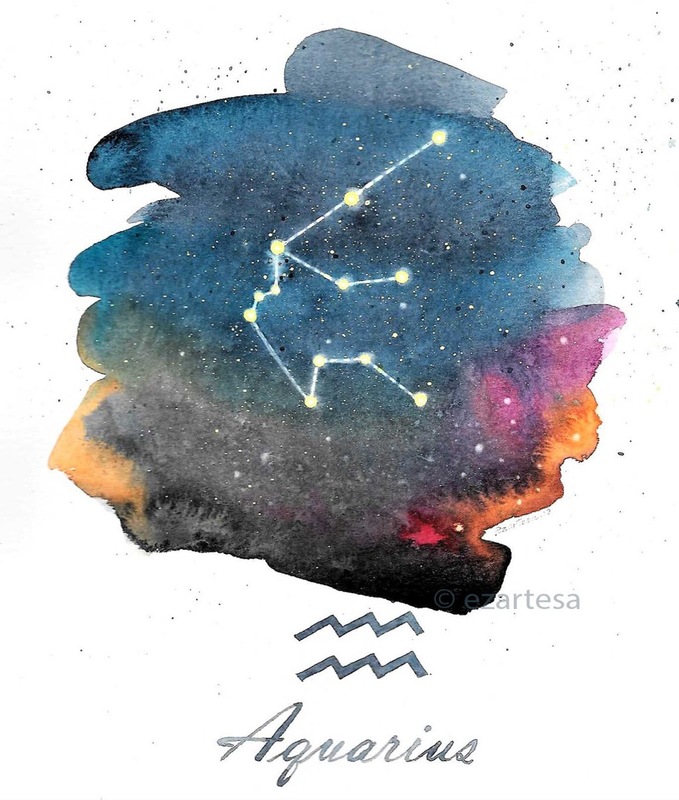 Aquarius individuals are always selfless and humane and love to have people around them. Amethyst, Labradorite, Aquamarine, Turquoise, Jade, Garnet, Lapis Lazuli, Dalmatian Jasper, Rainbow Obsidian, White Noble Opal. Amethyst is a powerful stone known to have strong cleansing and healing power. Soothing, calming to the mind and is believed to inspire and increase spirituality. It rids your home and body of negative energy while attracting positive energy. Wearing this birthstone during the month of February may strengthen relationships and provide courage when is needed. I created fun and easy beading tutorial inspired by Aquarius zodiac sign birthstones and colors. 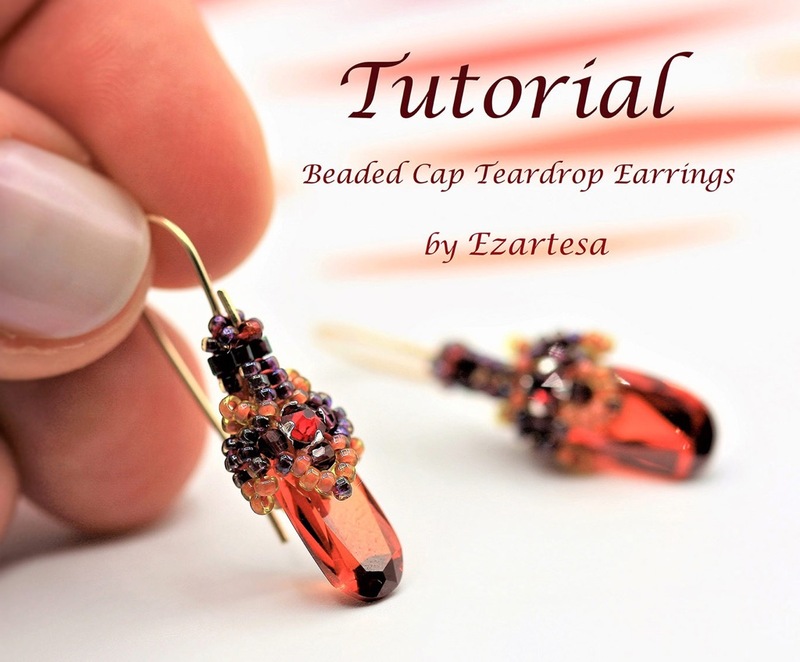 The beading tutorial includes instructions to make a fun pattern beaded bead and teardrops dangle earrings. Amethyst teardrop beaded cap is created from tiny glass seed beads #11 and #15 (rocaille). 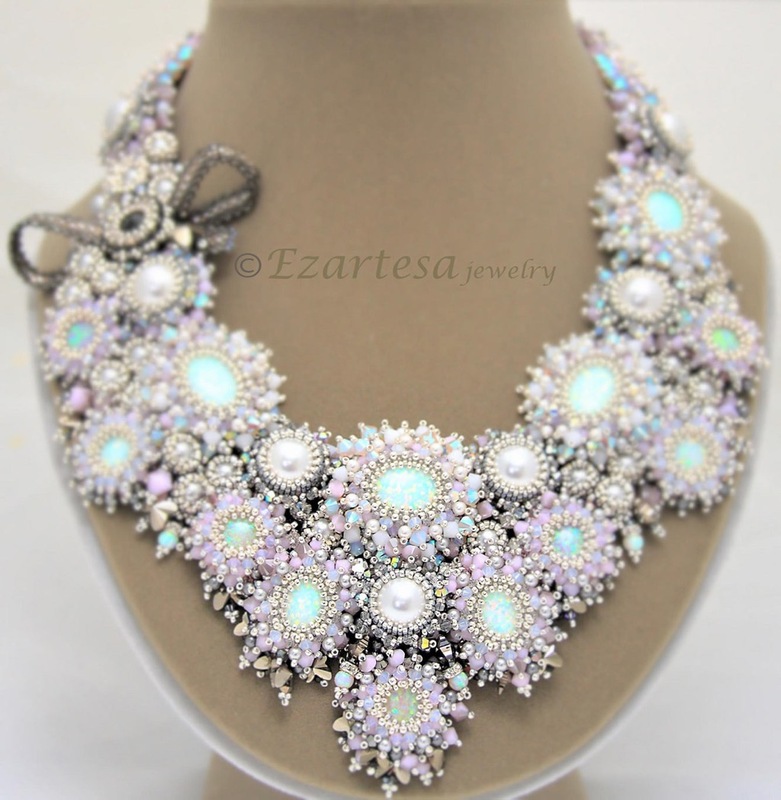 Purchase this pattern in my: EzartesaJewelry Etsy shop. Labradorite helps to awaken its wearer’s inherent magical and physic ability. It’s the stone of transformation. Protector from negativity, stimulates coincidence and synchronicity. 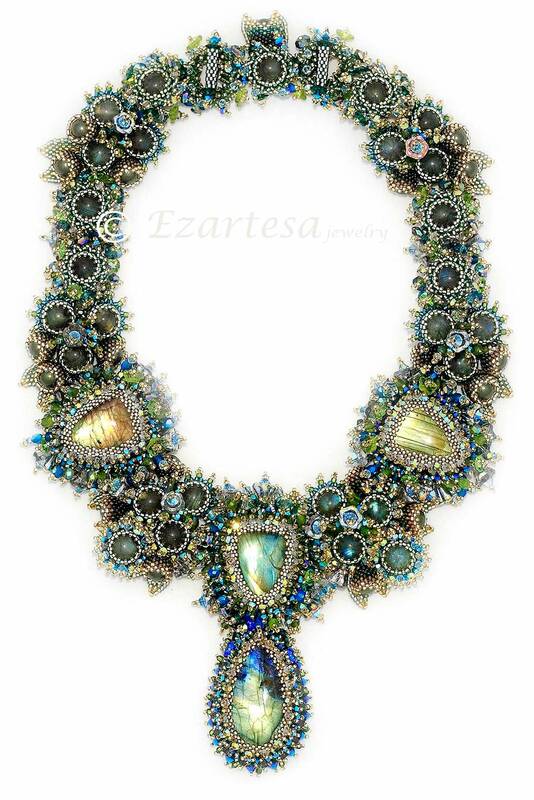 This gorgeous statement necklace is created by using natural Labradorite cabochons and beads, faceted Czech glass beads and tiny glass seed beads in green, grey, dark olivine, silver lined light green and blue. White Noble Opal is a stone of inspiration which enhances imagination and creativity. 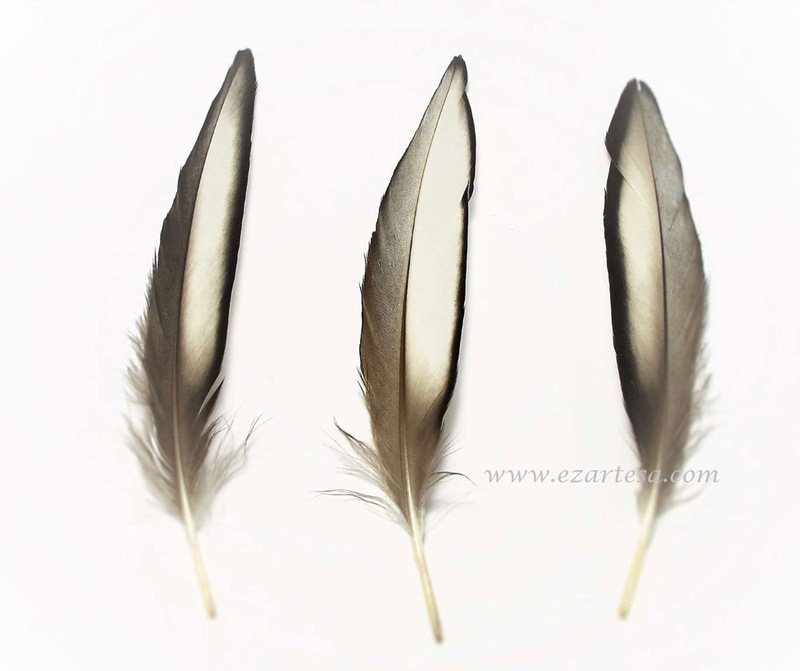 It’s good for bestowing beauty, power and for financial prosperity. 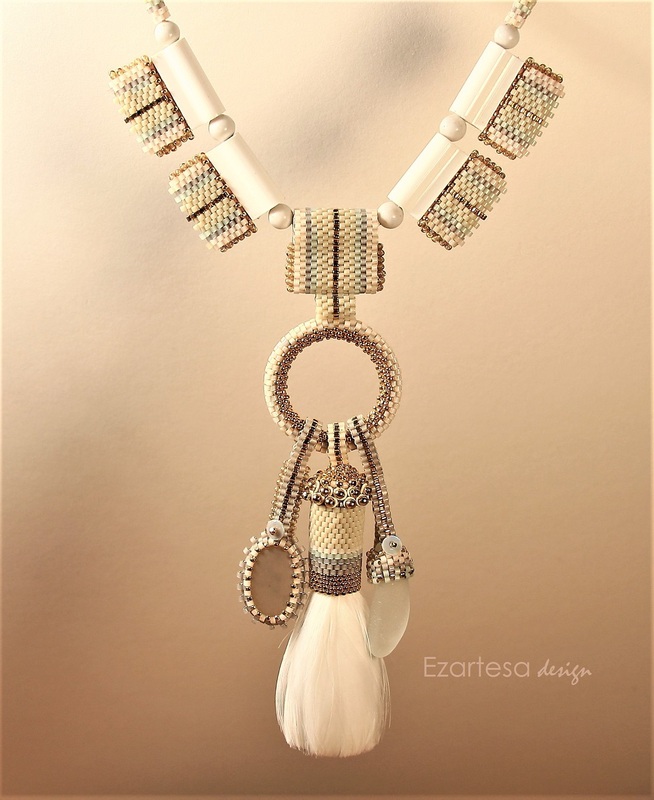 This necklace is created from tiny glass seed beads, manmade white opal cabochons and Swarovski crystals. Turquoise is known as a truth stone. Highly protective against negativity and psychic attach. This crystal can transcend the wearer beyond the physical realm and connect with the physical and spiritual worlds. This turquoise statement necklace is created from gorgeous turquoise cabochons and beads, lovely lemon color Chrysoprase cabochons and Rainbow Obsidian big round beads. 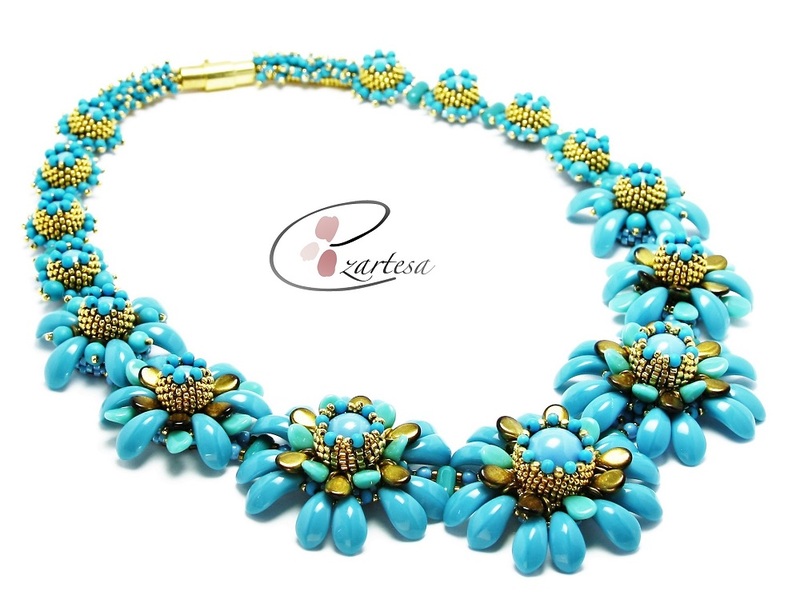 You can purchase this stunning “Turquoise Crush” beaded necklace there. Lapis Lazuli is believed to embody inner truth. Is said to promote self-awareness and enhance creativity. Lapis Lazuli brings spiritual love and is also known for enhancing love and fidelity within marriage. This bracelet is hand beaded from small Japanese glass seed beads, Lapis Lazuli Cabochons, brown goldstone cabochons and beads. 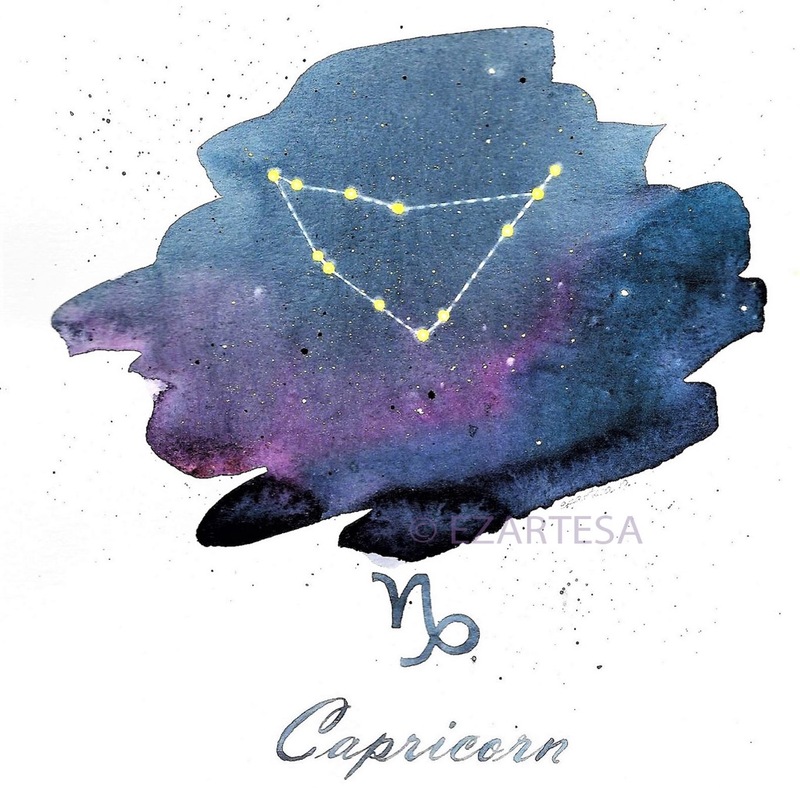 Capricorns are very ambitious people, they always have something they are pursuing, and they want their lives to be fulfilled and important. Garnet, Ruby, Black Onyx, Smoky Quartz, Jet, Amethyst, Blue Lace Agate. Garnet stone represents faith, love and constancy. Creates good vibrations and is often used in Capricorn birthstone jewelry, as it is a strong stone to create loving relationships. Garnet crystal is the birthstone in most ancient calendars for January, in which month Capricorn people are born. This gorgeous statement necklace is created by using natural, excellent clarity Garnet cabochons and beads, faceted Rhodolite Garnet beads and tiny glass seed beads in purple, lilac, dark purple, fuchsia, wine, gold luster cranberry, lavender and amethyst. You can buy this stunning “Purple Love” Necklace there. Beaded Garnet gemstone statement bracelet. Ruby stone provides strength, vitality, boosts self-esteem, it acts as a positive energy and a great support in handling relationships. Black Onyx stone keeps the person grounded, giving him better control of himself as he goes about realizing his ambitions. I created gorgeous and easy beading tutorial inspired by Capricorn zodiac sign birthstones and colors. The beaded cap teardrop earrings tutorial is created for an advanced beginning bead weaver. 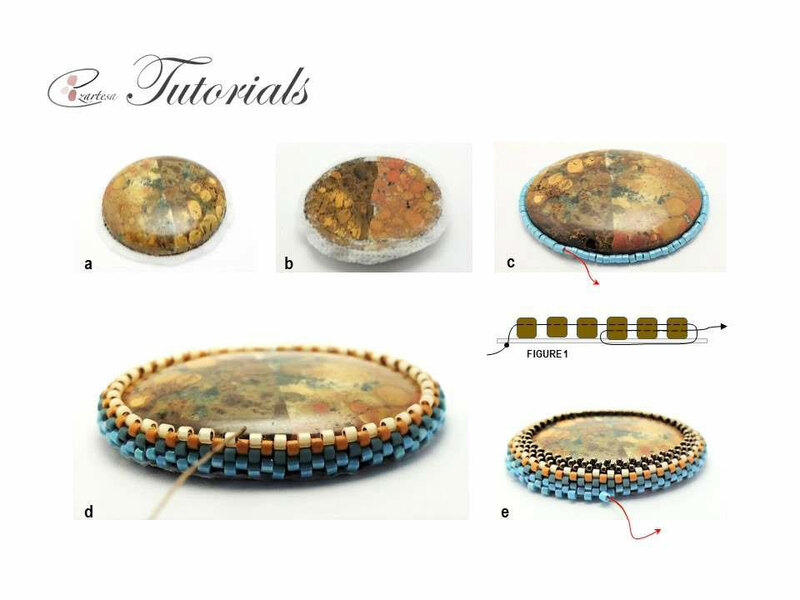 The pattern includes instructions to make the beaded cap for top drilled teardrops that you can use for earrings or pendants. Beaded cap is created from tiny glass seed beads #15 (rocaille), Swarovski crystal round beads and rose montees. Beading Tutorial includes 4 color pages with 41 color pictures. Beach-combing is a wonderful way to spend your free time by the water and a great way to get to know and explore your favorite Cape Cod beaches. On my trips to the shore I collect smooth and frosty gems – sea glass that later will be woven into beautiful Cape Cod-inspired Necklaces. 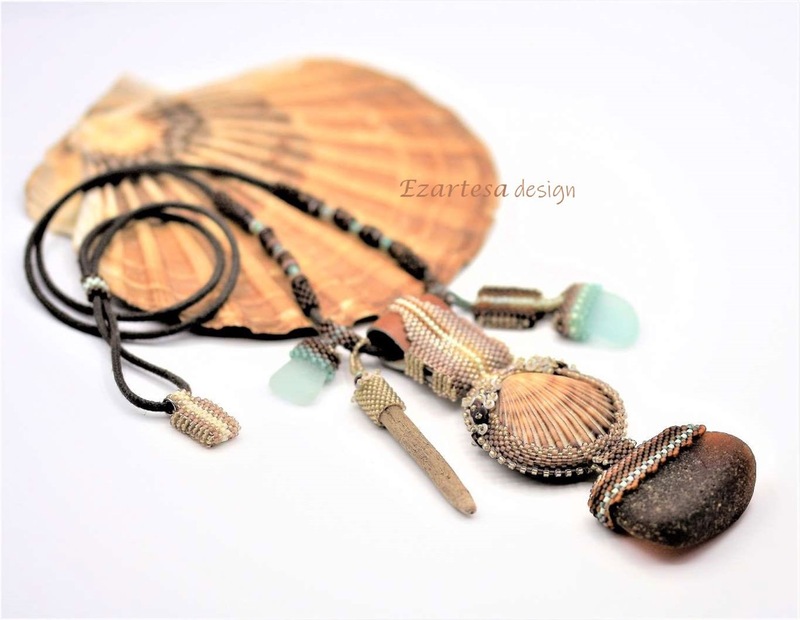 Beachcomber Necklace with Beach Stone and Sea Glass by Ezartesa. Tumbled by waves, recycled by the sea, sea glass is a product of both nature and man. 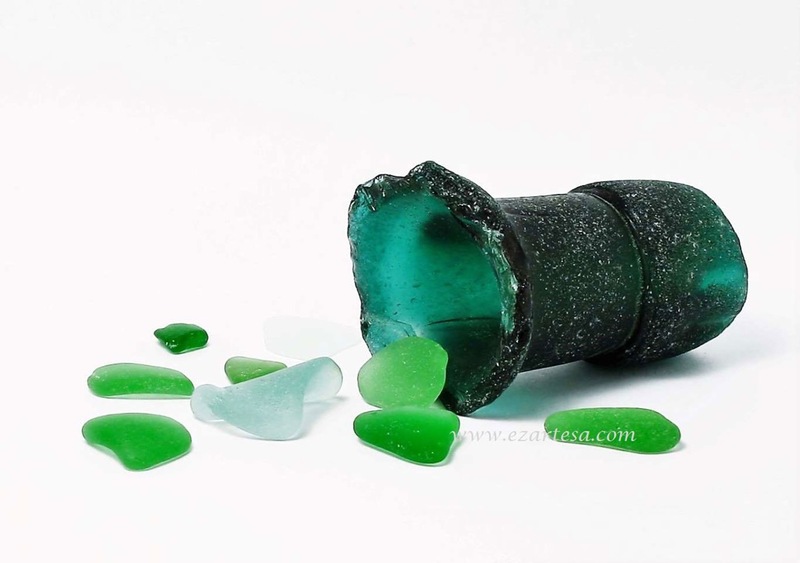 A quality piece of sea glass has no shiny spots, is well frosted, and has smooth edges. 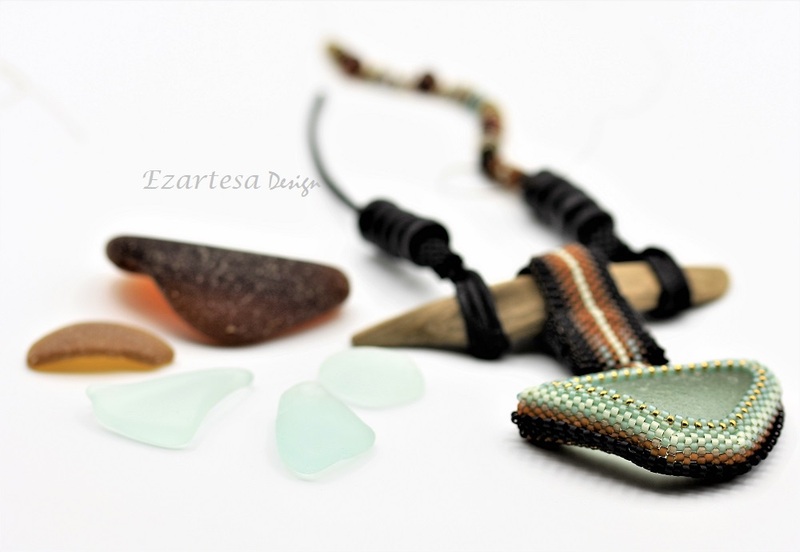 Beach Glass Necklace in Sea Green and Brown by Ezartesa. Every colorful and good quality piece I find gives me an idea of what kind of Cape Cod-inspired necklace I can create. First, I play with the shapes, then I think about color and then about the texture. Texture I create by weaving tiny glass seed beads around the piece of sea glass. 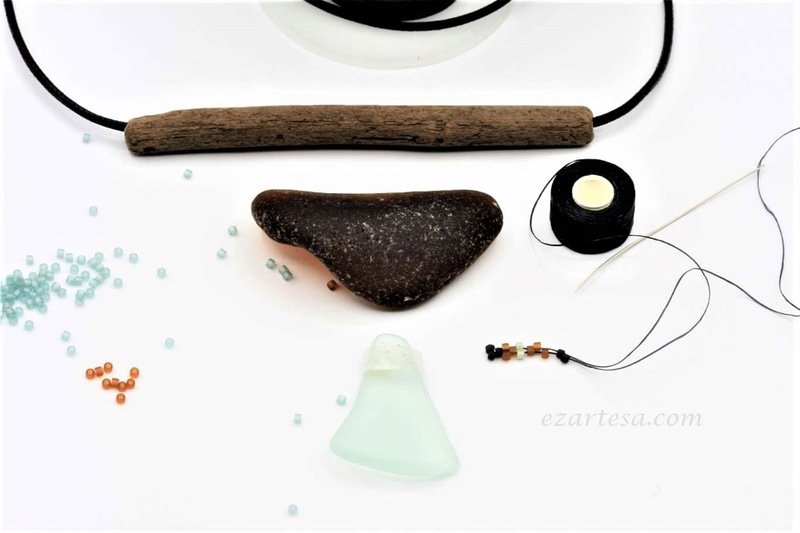 Sea Glass and Driftwood Necklace by Ezartesa. For my Cape Cod Jewelry, I use a natural leather. First, I cut a desired length and width of leather strip, then I embellish it with tiny glass seed beads. 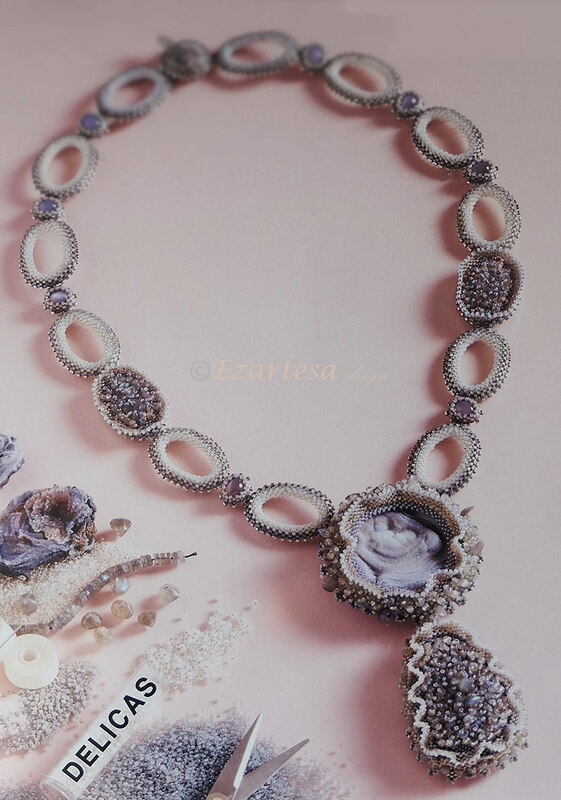 Lavender Sea Glass Necklace by Ezartesa. While there are plenty of different kinds of shells and sea glass to discover, there are also wonderful beach rocks to be found on the shores of Cape Cod. I love collecting clear and milky quartz in different shapes and colors for my Cape Cod Necklaces. I use these adorable beach stones as a focal/center piece for my necklaces, and embellish them with matte, opaque and gold-plated glass seed beads. 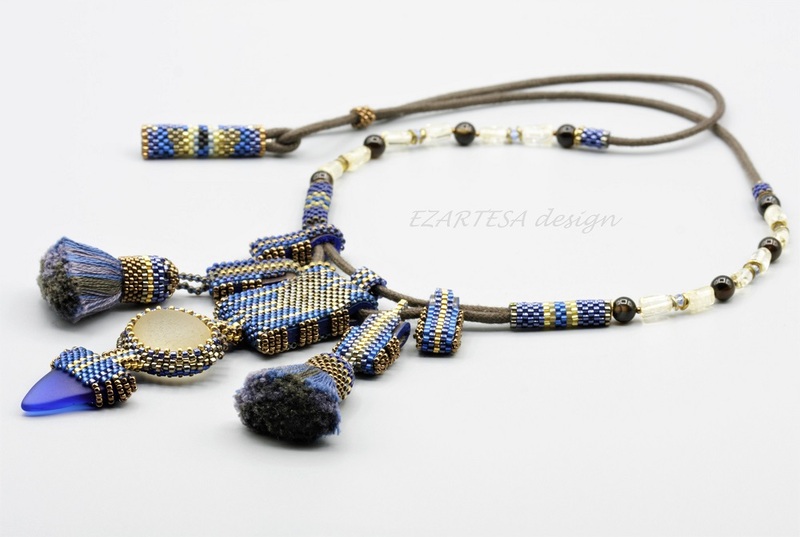 Blue Sea Glass and Citrine Beach Stone Necklace by Ezartesa. These pebbles are abundant on all the Cape beaches. 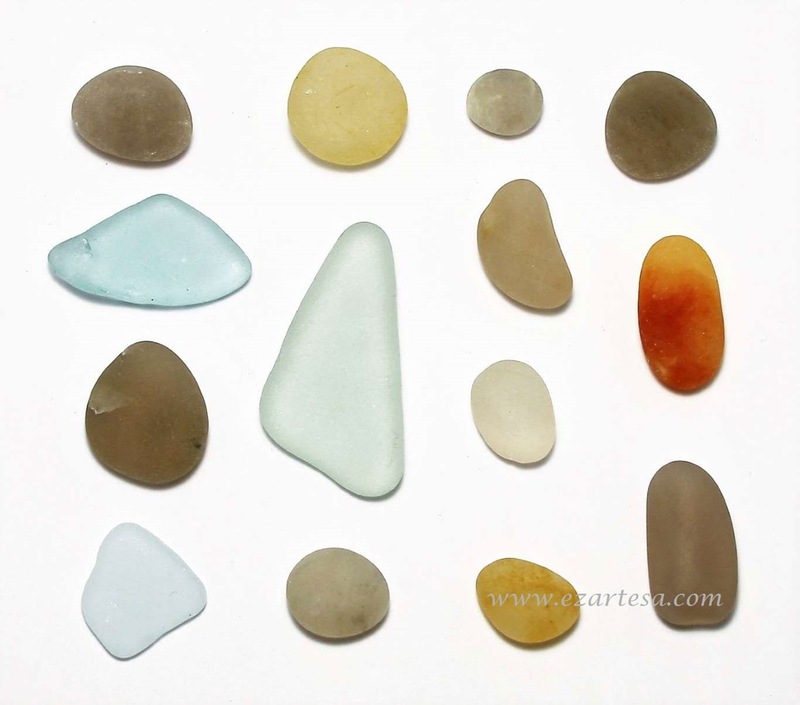 What I am looking for when beachcombing, is whatever appeals to me: smooth, beautiful round or oval-shaped milky stones in peachy, yellow or grey colors. My favorite beach stone is clear quartz in light yellow or smoky brown color. I treasure the stones that fascinate me personally, that challenge my thoughts and imagination. This is where my inspiration comes from every time I go to the beach. 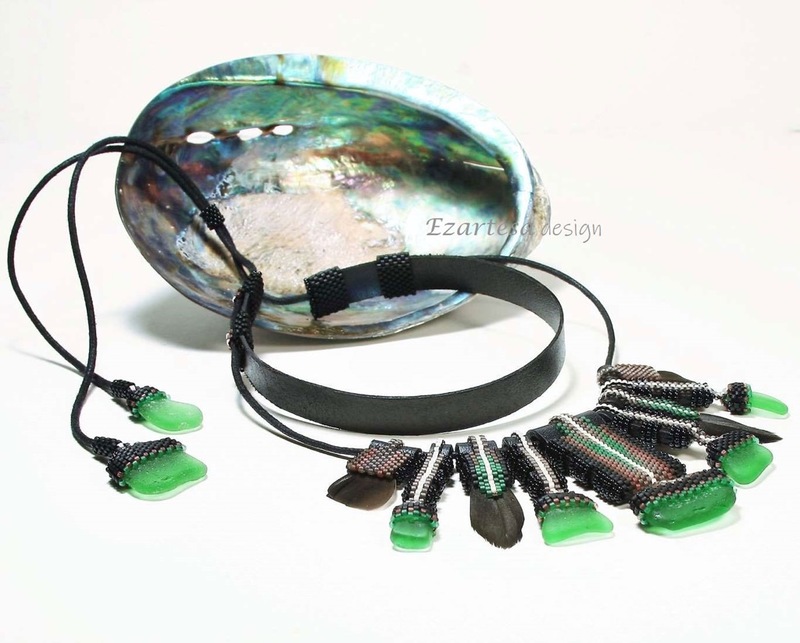 Sea Green Sea Glass and Feather Beaded Necklace by Ezartesa. Other items that I collect are driftwood and feathers. 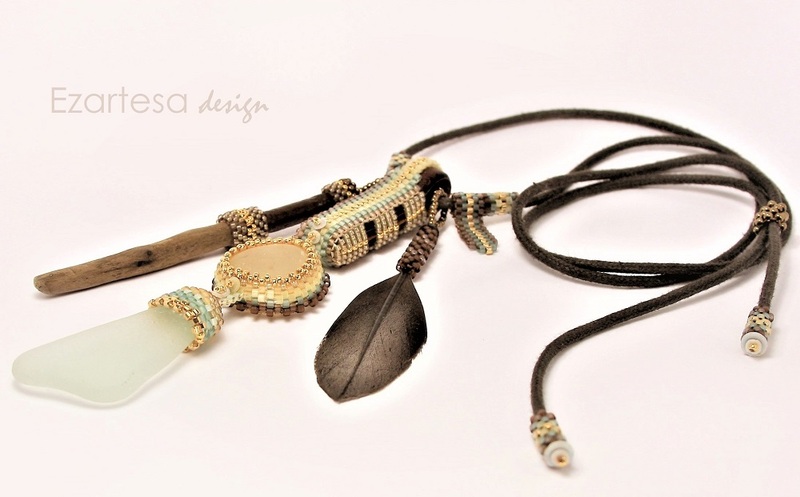 White Feather, Beach Stone and Sea Glass Beaded Necklace by Ezartesa. The jewelry you wear is an expression of your personality, passions, and lifestyle. While I design a new piece of jewelry I always think about what feeling, what mood and what story I want to tell with the jewelry piece I’m working with. 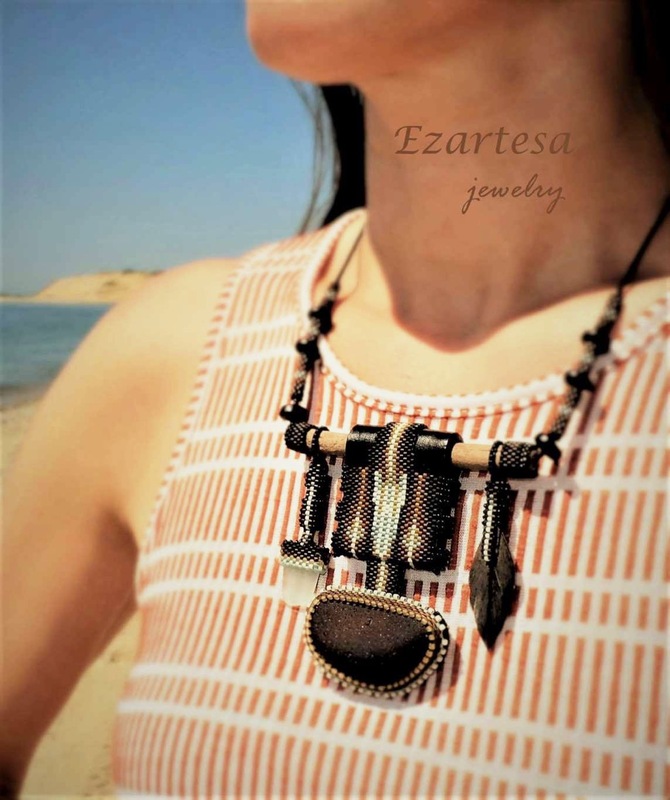 Ezartesa's handmade jewelry for sale online. I created a gorgeous collection of beaded necklaces and earrings tutorials that are created from tiny gold plated glass seed beads, Turquoise gemstone beads, turquoise color Swarovski crystal pearls, turquoise color Magnesite and Czech, German glass beads. These fun beading tutorials are from start to finish, with complete explanations, and lots of clear pictures. 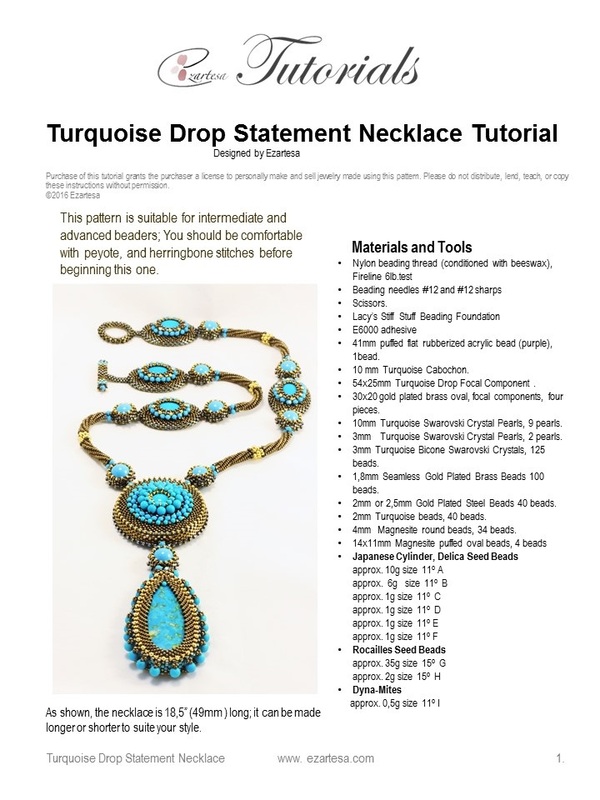 My most popular, bestselling necklace tutorial is Turquoise Drop Statement Necklace. Through this tutorial, I am showing you how to create this gorgeous piece of art with its basic techniques and tips used in this project. This material includes 14 color pages. Step-by-step instructions with 80 color pictures, 11 diagrams. Inspirational photos of other pieces of mine created with the same technique. My beaded necklace tutorial Turquoise Flower Necklace is very fun to make. Learn how to make large, medium and small size flowers with 12mm, 10mm, 8mm Pearls, seed beads and Preciosa Czech glass petals! This material includes 11 color pages. 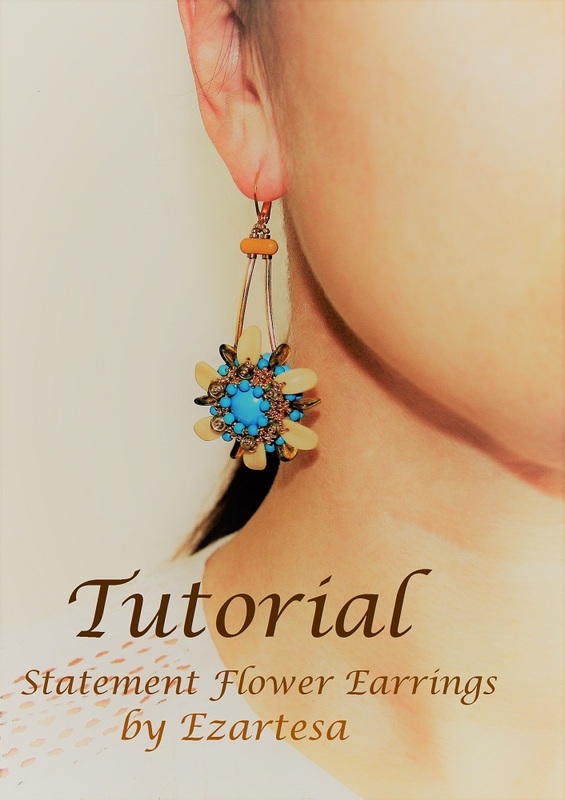 Through this Statement Flower earrings tutorial learn how to work with interesting materials: gorgeous turquoise pearls, luxurious gold beads, Czech glass, and touch of vintage German beads! This material includes 5 color pages. Through this Beaded Turquoise Pearl Dangle Earrings Tutorial I am showing to you how to create these gorgeous earrings with its basic techniques (peyote stitch) and tips used in this project. This material includes 5 color pages. Skill Level: intermediate, and for determined beginners. 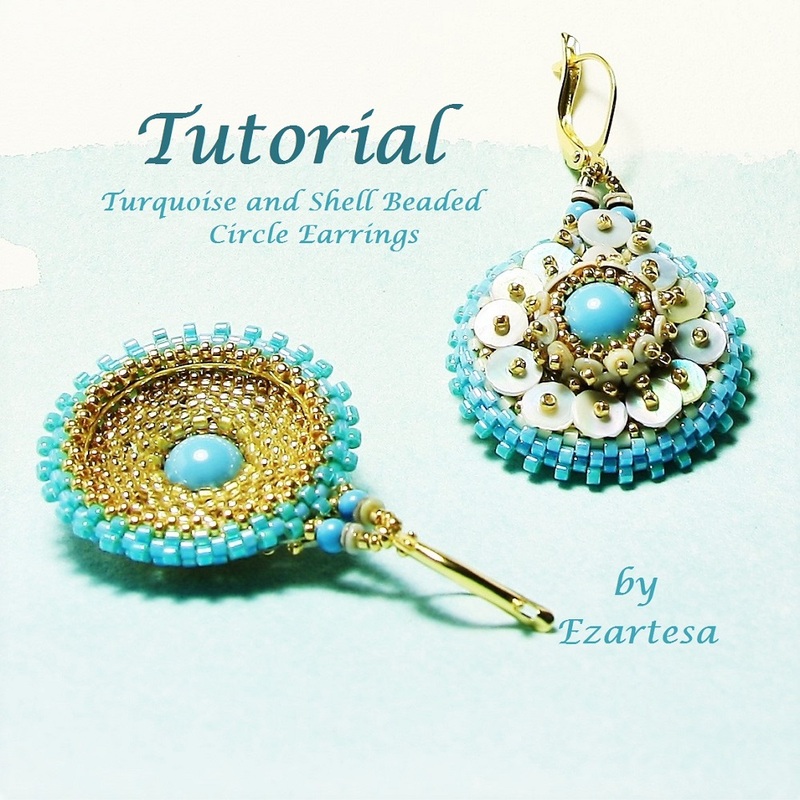 This is a Tutorial, Pattern of these gorgeous Beaded Circle Earrings with Swarovski turquoise crystal pearls, shell heishi beads, and tiny gold and turquoise seed beads. Lear how to make these stunners! My beading tutorials are very easy to understand and follow. 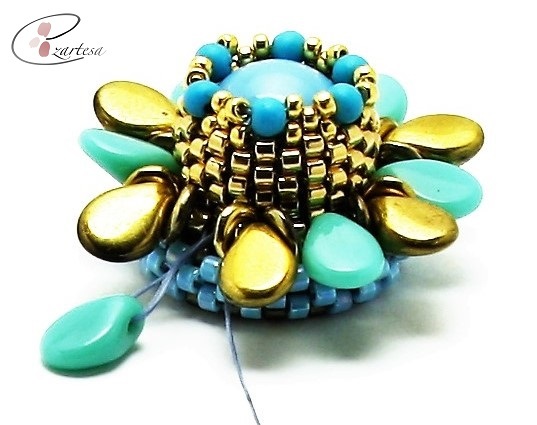 Make a statement when you craft and wear these very stylish and unique Turquoise and Gold Seed Bead Jewelry Designs!